With a view to inculcate the habit of reading among the students,C.B.S.E. 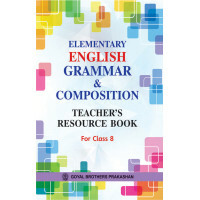 has introduced compulsory reading of a LONG READING TEXT in the English Core Course. Under this Section, C.B.S.E. has prescribed the novel THE CANTERVILLE GHOST as a long reading text. There will be two long questions on the theme, plot, character and incidents from the prescribed the novel. Keeping this in mind, this book has been specially designed to help the students become familiar with the latest pattern and make them prepare for the exams thoroughly. Chapter-wise meanings of difficult words, expressions and phrases. Chapter-wise summary for quick recapitulation. Text-based solved questions involving interpretation and inference in each chapter. Questions with solutions based on characters are provided in each chapter. Large variety of Solved Long Questions based on theme, plot,character and incidents based on entire novel are provided.